Step 1: Plan your space and bed size, my supply list will reflect my project size. Step 4: Slip in the lumber to the brace corners and check that area is level. Adjust. Use stone pavers as needed to level. 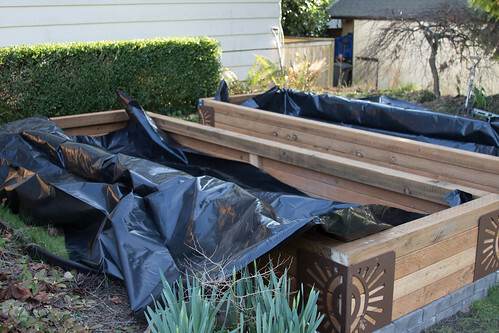 Step 5: Reinforce the midspan of the 12-foot section with a stake to reduce wood warping. Step 6: Fill bottom of bed with dirt or sand to LEVEL floor of bed. Check with a level all over floor. Note: The base of the bed needs to be level so that the water will not pool to any one area. Step 7: Line entire bed with one sheet of plastic up the sides as well. 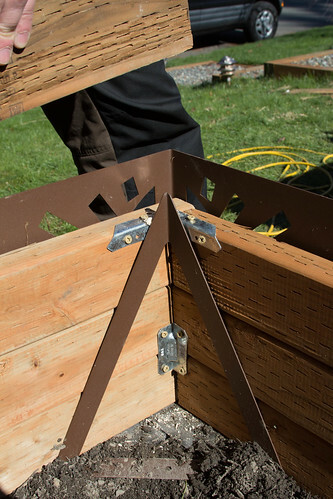 Use electric staple gun to attache to upper rim of box. 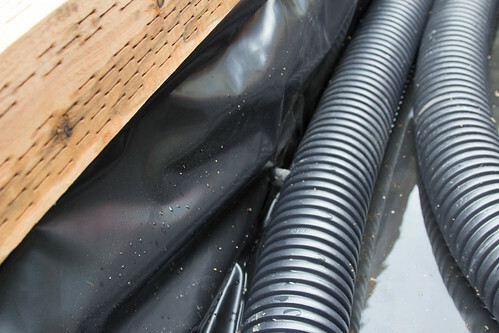 Important: Do not poke holes in this plastic anywhere below 3-inches above the floor of the bed or the system will leak. 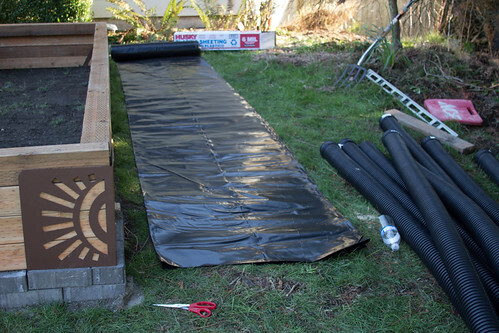 Step 9: Cut Landscape fabric to fit over all tubes with enough slack to touch the floor between each tube. Note: This step is to keep the roots from growing inside of the tubes so that it's easy to clean up for the following year. Install the overflow tube at the end opposite of the water filling side. 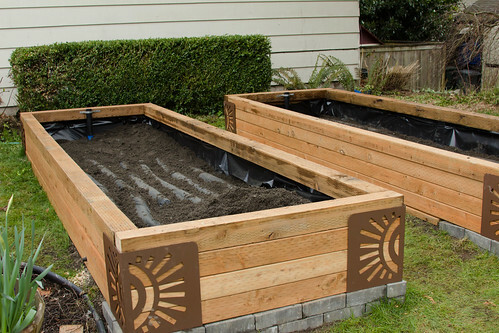 Step 11: Fill bed with garden soil. Note: At this point you could put 1/3 of the dirt in and then fill with water to see it in action. Step 12: Stand back and admire, plant seeds & water as needed. 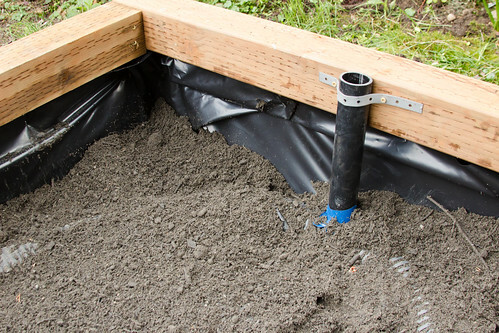 You need to leave some room between the pipes so the soil comes in contact with the water. 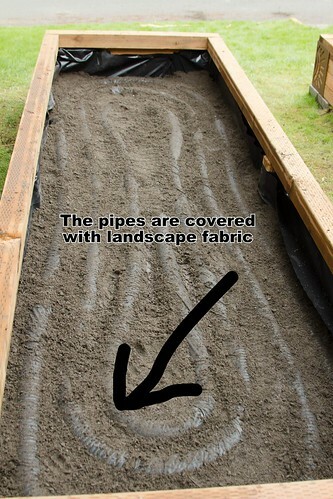 Make sure you pack the soil down between the pipes, as the soil acts as a wick for the water - capillary action. The purpose of the pipe is two-fold. 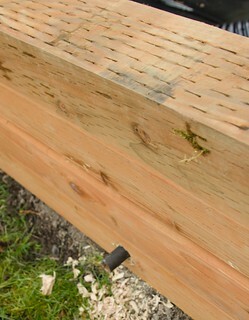 It transfers the water throughout the bed and as the soil wicks up the water the pipe provides a space for oxygen. This project rooted from inspiration from a trip to Denmark where I saw a gardening trend with a foam, store bought system, I went on to research the concept and find a system that I could contstruct at home. Time home sick with a cold in February from work, was time well spent! I am following the great research done by Johanne Daoust, who was kind enough to post her process on Flickr. 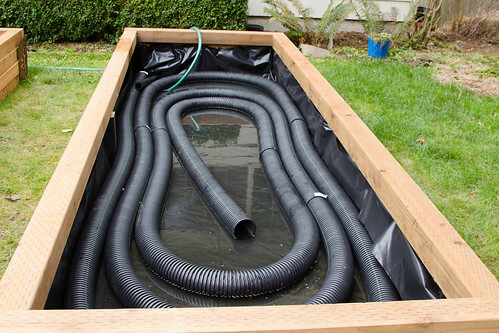 One other great system to check out for those who want to keep containers individually self watered, should look at the self-watering rain gutter system.